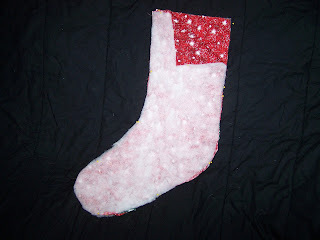 Apples to Applique: Christmas Stockings! 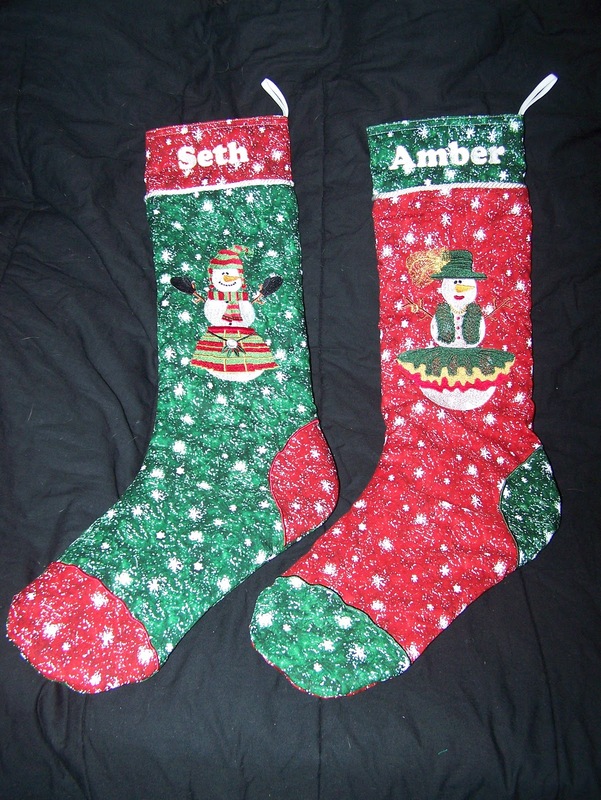 As this is my first Christmas as a married woman, I wanted to make new stockings for me and my husband. 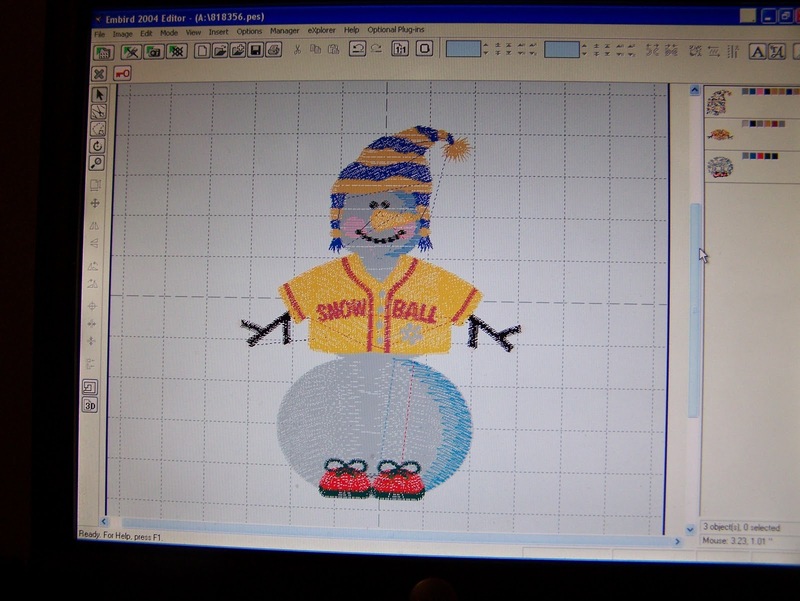 We have decided to use snowmen as our main "theme" for Christmas decorations, so when I came across the Build-a-Snowman embroidery design pack from Embroidery Library (www.emblibrary.com), I knew the designs would make some adorable stockings! 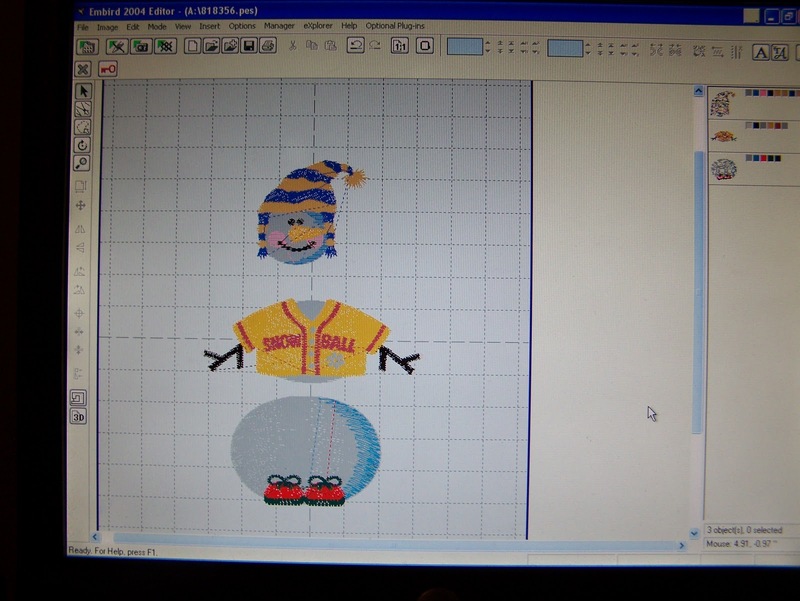 This design pack comes with several individual snowman heads, middles, and bottoms for you to mix and match to create your individual snowman. 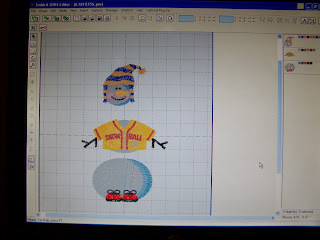 My husband designed his, picking a bottom with a kilt (which didn't surprise me), a middle with a scarf, and a head with a winter hat. He even picked out the thread colors he wanted. For my snow-woman I went with a bottom with a frilly tutu, a middle with a fur, and a head with a fancy hat. ...and place them exactly where I wanted them. After that, I "locked" all three pieces together so that they now moved as one and became one big design, and there was no chance of me having a disconnected snowman. 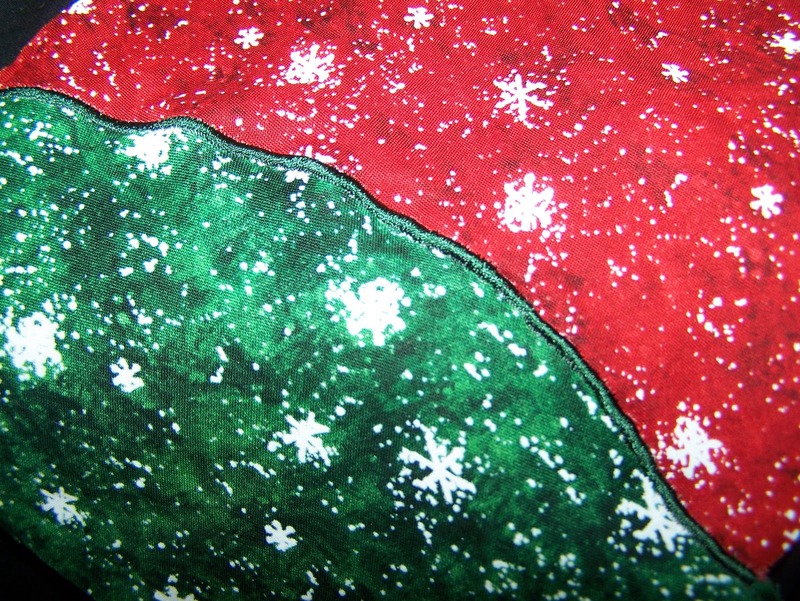 It also sorted out the colors, and, whenever possible, programmed the design to stitch out all of one color at once. This means that (as long as it works in consideration with layers and shading) it would stitch out, for example, the white in the head, middle, and bottom all at once, instead of doing the multiple thread changes as would have happened when using the original design. Love this software! I didn't have a stocking pattern and didn't feel like going to the store and buying one, so I made one myself. 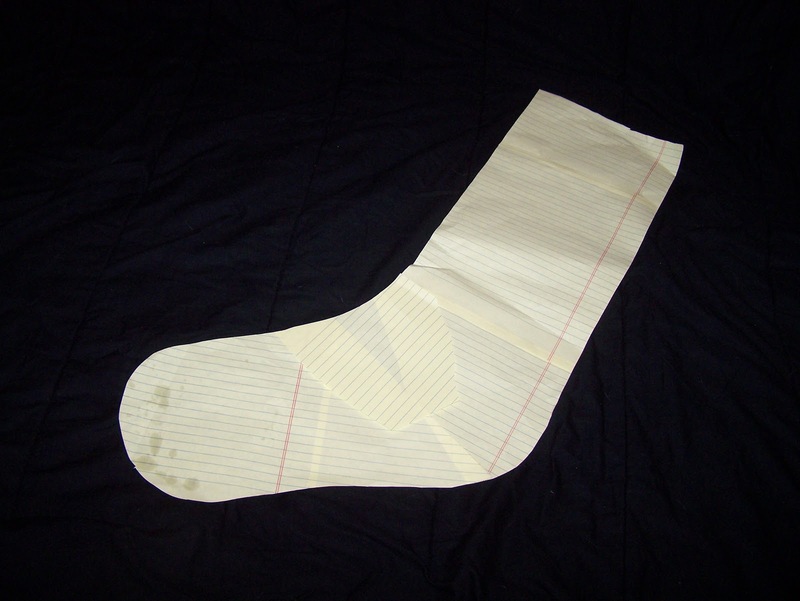 I also didn't have any pattern paper on hand, so I used notebook paper taped together, on which I drew a large sock shape. It looks super ghetto, but it got the job done--and besides, who has time for a trip to the store when inspiration strikes and things you have on hand will work? I used two different colors of fabric (1 yard of each) for the stockings. With the size I made the stockings, a yard and a quarter would have been much easier to work with, but I managed. 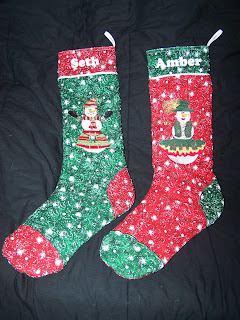 My husband's is green with a red cuff, toe, heel, and lining, while mine is red with a green cuff, toe, heel, and lining. I cut out 4 pieces of each color from the pattern above. 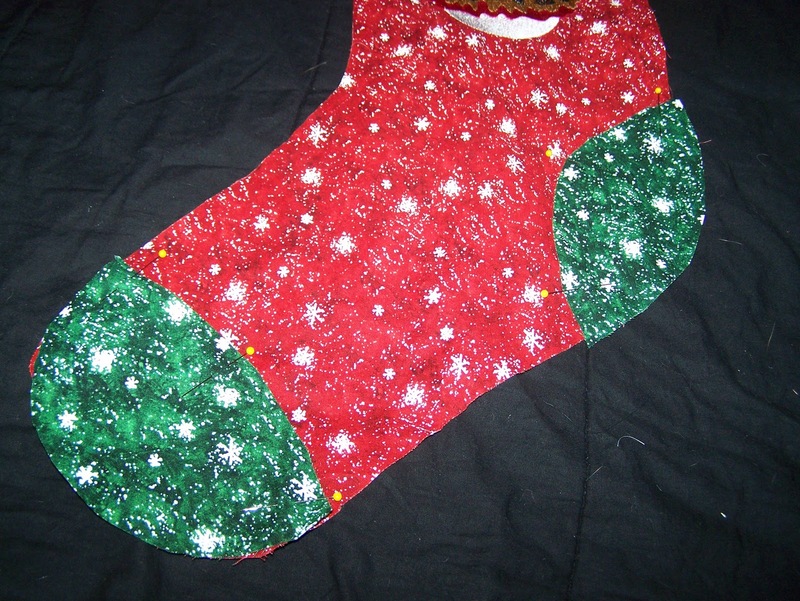 Each stocking takes 2 of each color--the main color for the front and back, and the accent color for the front and back lining. 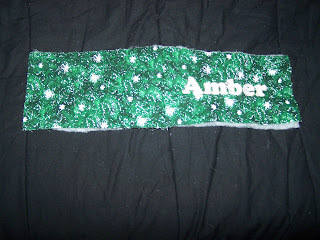 I cut the 4 pieces for each, then chopped off 4-5 inches from the top to make into the cuff. Here's where hindsight comes in. 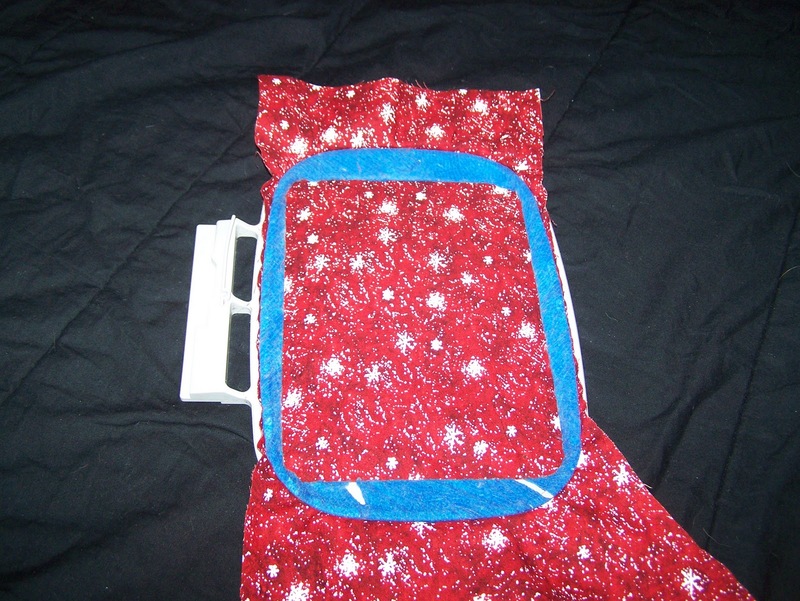 Had I been thinking through this, I would have only cut the cuff part off of the main fabric, and not off of the lining pieces as well, because, as it is a false cuff, this just gave me an extra (and pointless) step when I went to put the lining together, as you will see later. I also decided to cut 1 front and 1 back (including the cuff pieces) out of quilt batting for each stocking, because the fabric I was using was very thin and I wanted a little more body to my stockings. 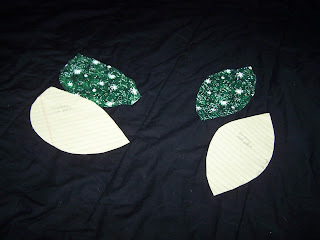 Next, I cut out 1 toe piece and 1 heel piece from each color (the patterns also made from notebook paper, because I'm classy like that). At last, time for the fun part! I prepared the stocking front for embroidery by marking the center and hooping it with the stabilizer. 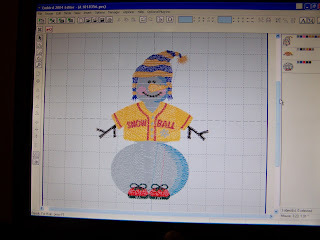 Then I stitched out the snowman design. These designs take quite a bit of time as they have roughly 27,000 stitches in each one, so you might want to have a book or a handiwork project handy as you babysit the machine for the next hour and a half or so. I love the finished design! ...then stitched them on using a tight zigzag, much like a buttonhole stitch. I used embroidery thread for this step because I like how nice and shiny it is. 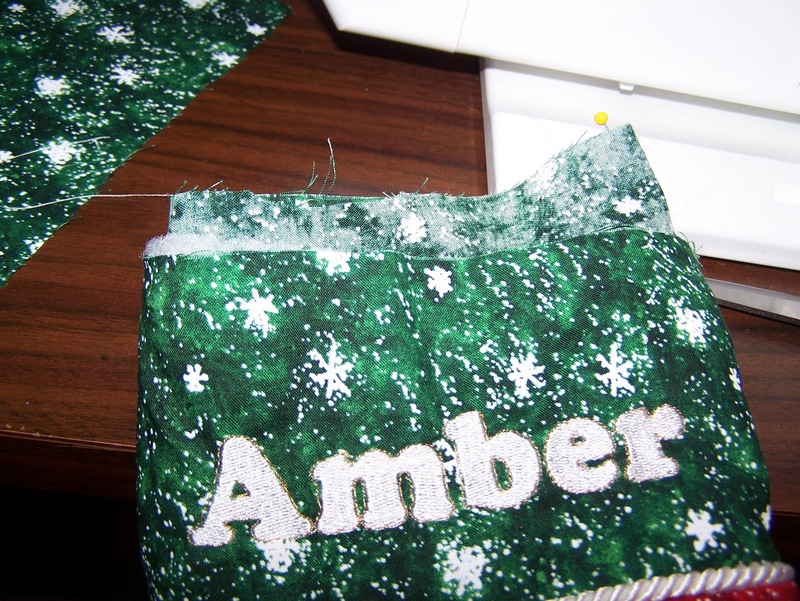 I found it helpful to stitch on some scrap pieces first to get the stitch length and width the way I wanted it. This step takes a little bit of time, but it looks so nice when it's done. 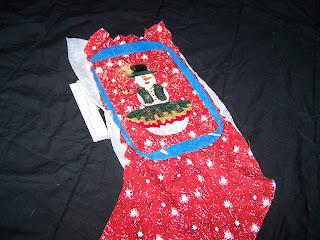 After this, I pinned the batting to the front and back stocking pieces. You may choose to baste the batting on at this point. I didn't because I didn't feel like it, and am used to manipulating multiple layers of fabric at a time. 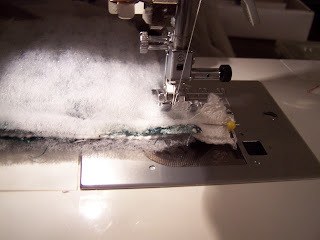 If you are newer to sewing, it's probably a good idea for you to baste it around the edges. 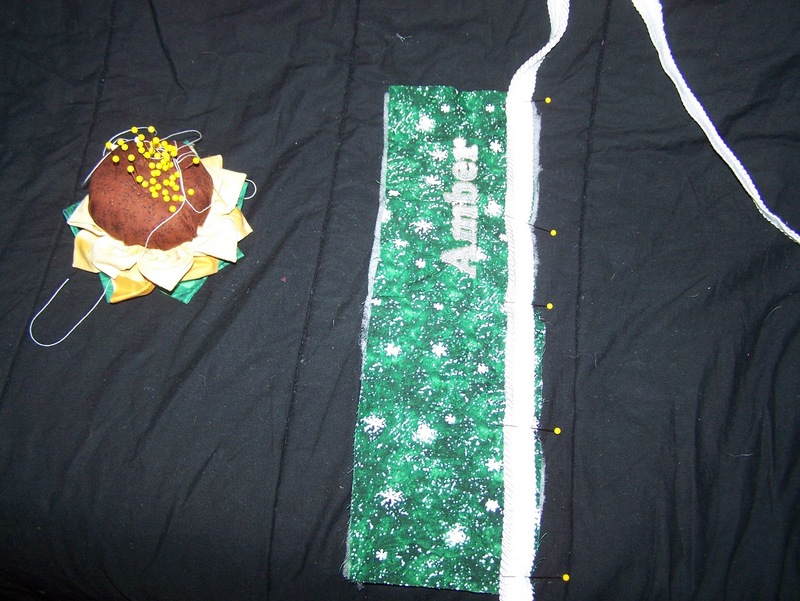 Next, I pinned the front and back together with right sides facing and stitched around the outsides, leaving the top open. 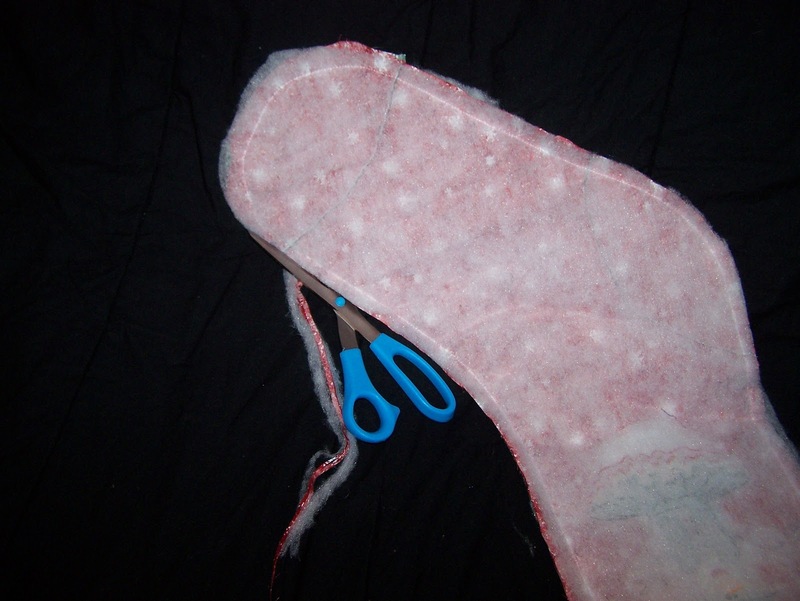 I then trimmed the seams and clipped the curves to eliminate bulk in the stocking. 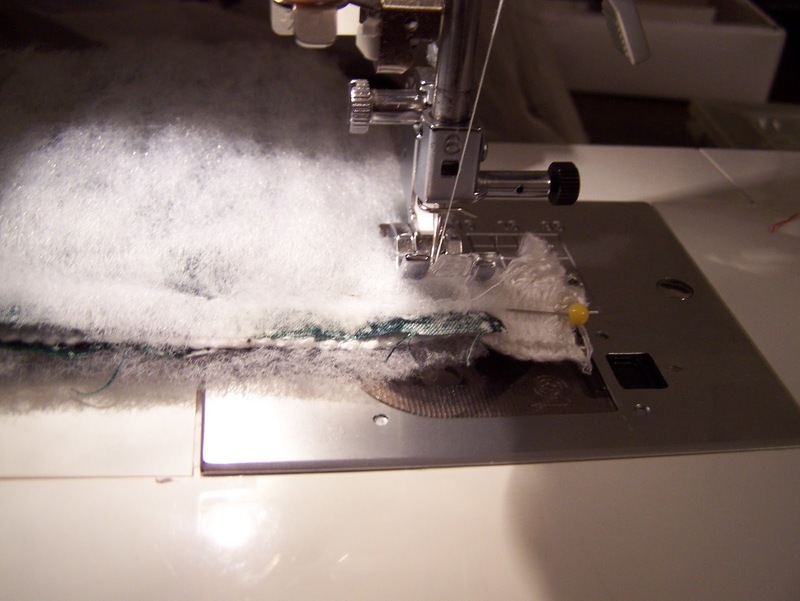 Why trim the seams, you ask, instead of just stitching them with a narrower seam allowance in the first place? That is an excellent question for which I have no answer. 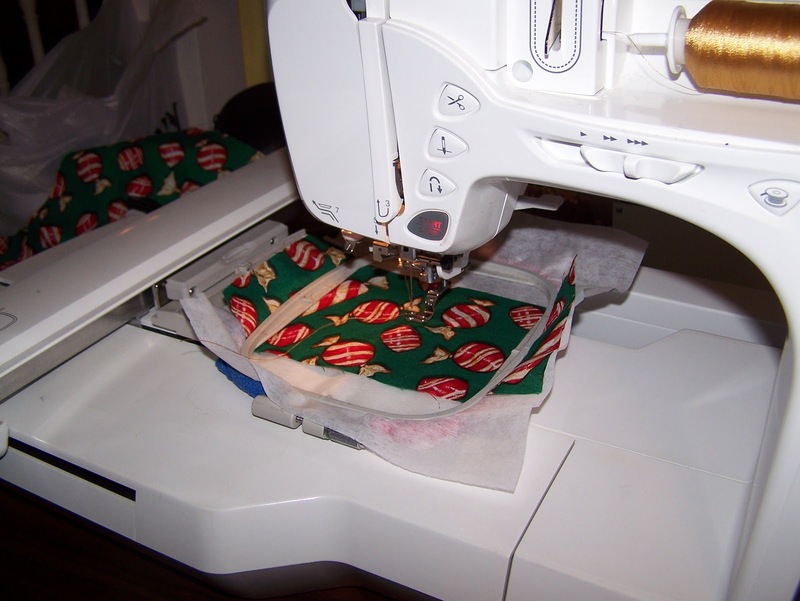 All I know is this is how I was taught to sew. 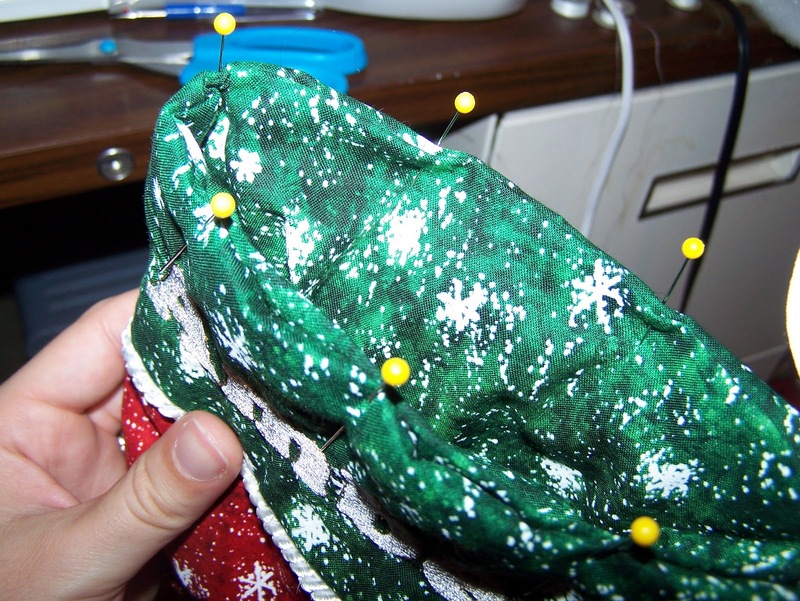 :) Perhaps it has something to do with the fact that it's a little easier to work with a larger seam allowance. 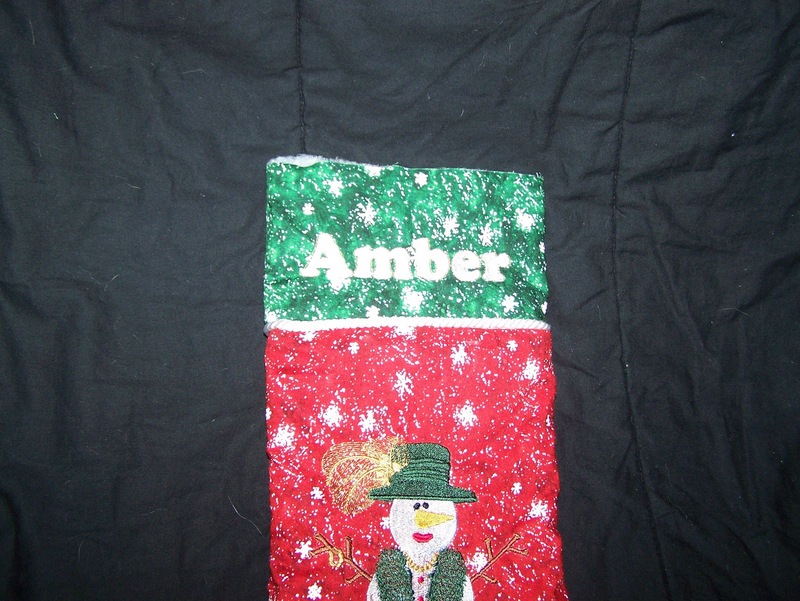 After trimming the seams and clipping the curves, I turned the stocking right-side-out and set it aside. Next, I pinned the batting to the back of the cuff pieces (again, you may choose to baste at this point) and stitched the pieces together on one side only. 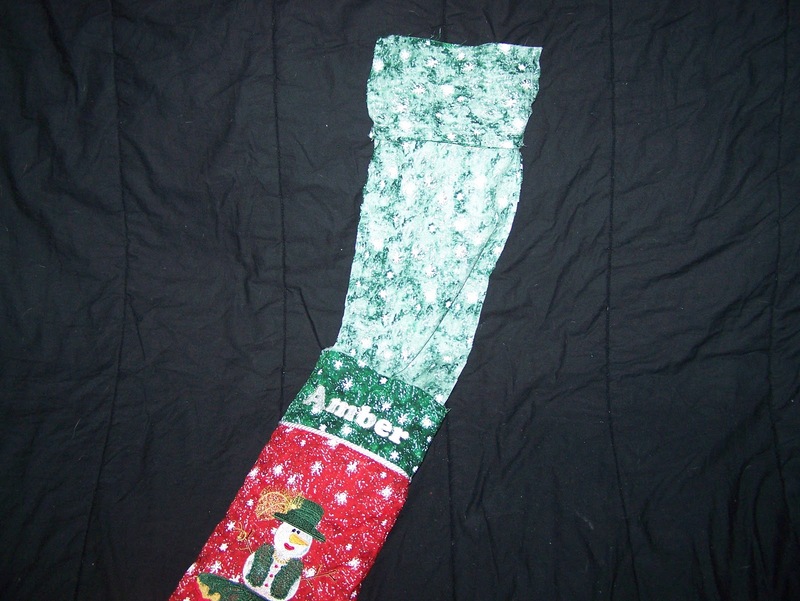 I left open the side where I was going to put the hanging loop, which lines up with the heel side of the stocking. I left this one side open because I chose to add a decorative trim between the cuff and the stocking. 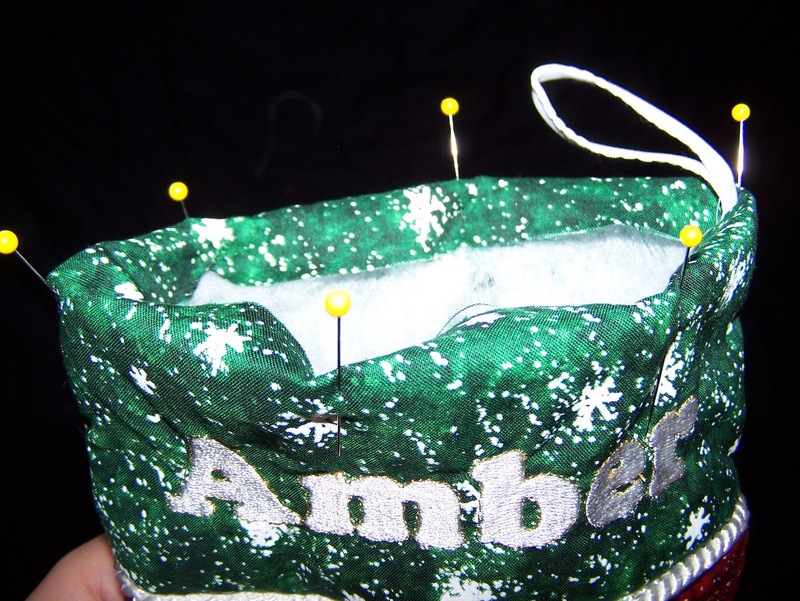 If you don't wish to do that, you can go ahead and stitch both sides together so that you have a little tube. I pinned my trim along the bottom edge of the cuff and then basted it in place. 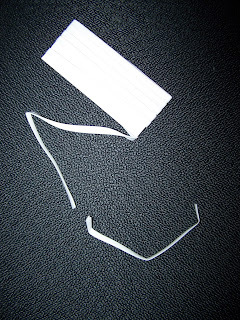 Then I folded the cuff, right sides together, to stitch the last side seam together, catching the ends of the trim and making the little tube mentioned above. 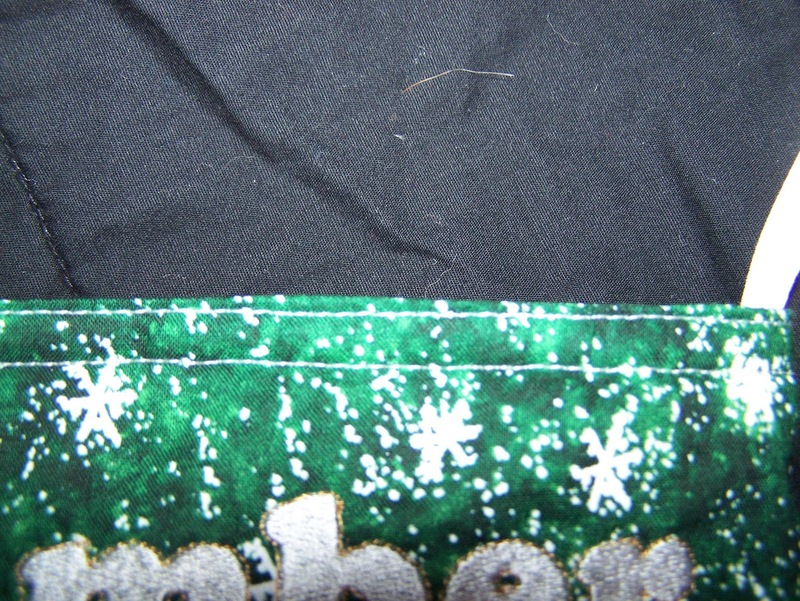 If you look in this picture you can see I am stitching through the ends of the trim in the seam, which gives the trim a nice finish on the right side. Leaving the cuff inside-out, I pinned it to the top of the stocking, lining up the side seams. 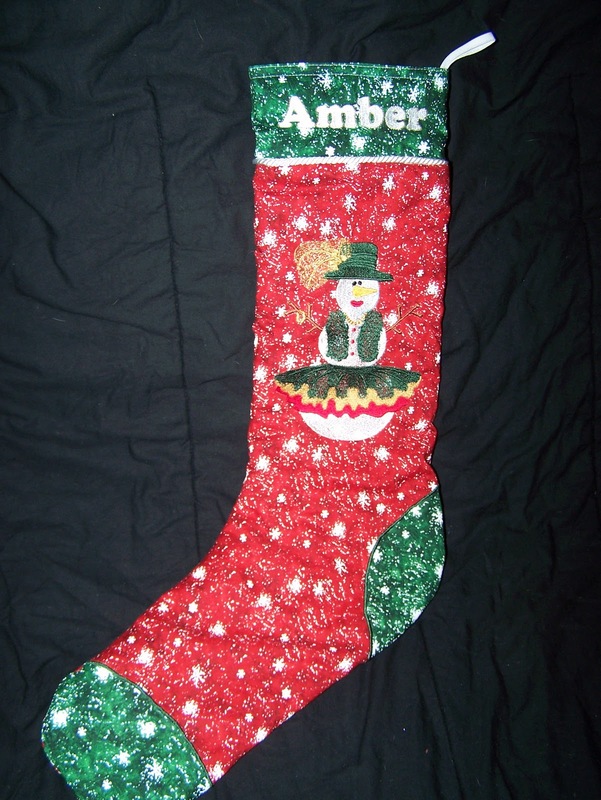 Make sure you have the part with the name on the front of the stocking and going the right direction! I stitched the two pieces together. The only tricky thing about this part is if you are using a trim. I just had to feel with my fingers to know where I should be stitching to be at just the edge of my little rope trim while not stitching through it. Unfortunately I don't have any better advice than that, but it's worth it when you turn it right-side out and see how amazing it looks. At this point, I set the stocking aside and constructed the lining. I pinned the lining front and back together with right sides facing and sewed around the whole thing, leaving the top open. 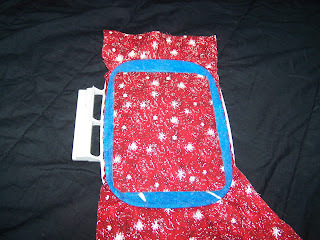 Then I stitched the lining cuff pieces together at the sides and attached them to the lining body just like I did above. This is that extra step I was talking about in the beginning. There was absolutely no point in this, except that I had chopped my lining short and needed it to be the same length as my stocking body. Because you are brilliant and will have thought through this ahead of time, you will have a nice lining all in one piece and won't need this step. ...until it was all the way down inside and the top edges were flush. 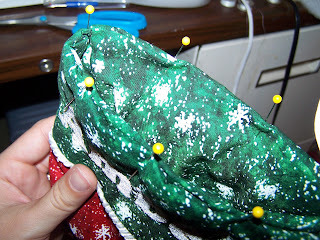 The only tricky part about this step is making sure that your lining doesn't get twisted around inside and you end up sewing it in such a way that the toe side of the lining is on the heel side of the stocking. 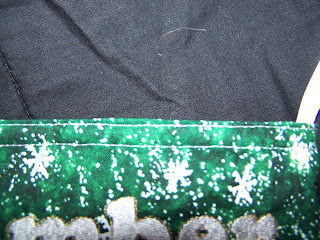 You can see in the picture above one pin stuck into my lining. I put this on the heel side of my lining so that I knew exactly what I was working with once the lining was all inside and all I could see was the upper edge. At this point I set the stocking aside to create the hanging loop. I decided to make this out of narrow double-folded seam binding, so I cut off about 4-5 inches of binding. I stitched the edges of the seam binding closed, and then folded the piece in half and pinned it on the seam to the heel side of my stocking cuff, the raw edges lined up and the loop hanging down. 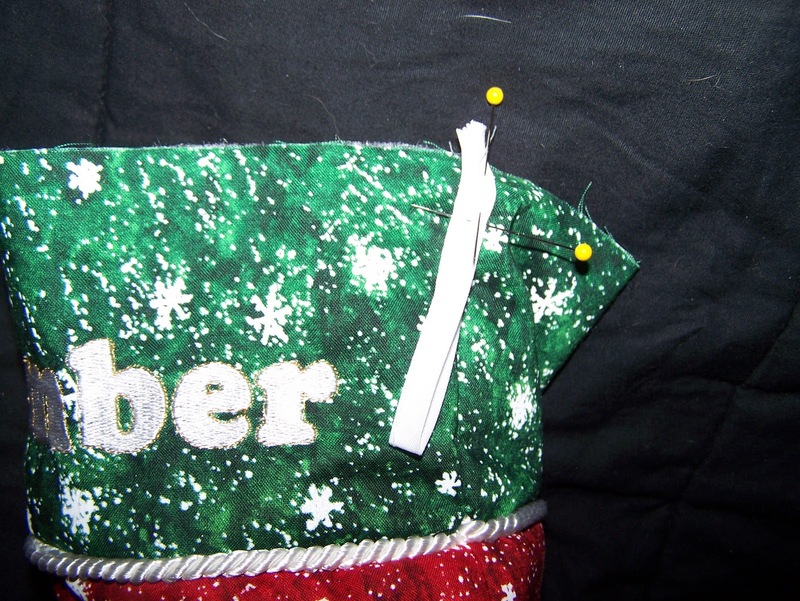 Being careful not to catch the stocking lining, I stitched the loop in place. Again, hindsight. 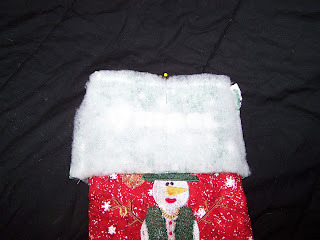 There's really no reason I couldn't have attached the loop to the stocking before I stuffed the lining inside, which would eliminate the need to worry about catching the lining while sewing on the loop. However you choose to do it, though, the result is the same. Finally, the last step! 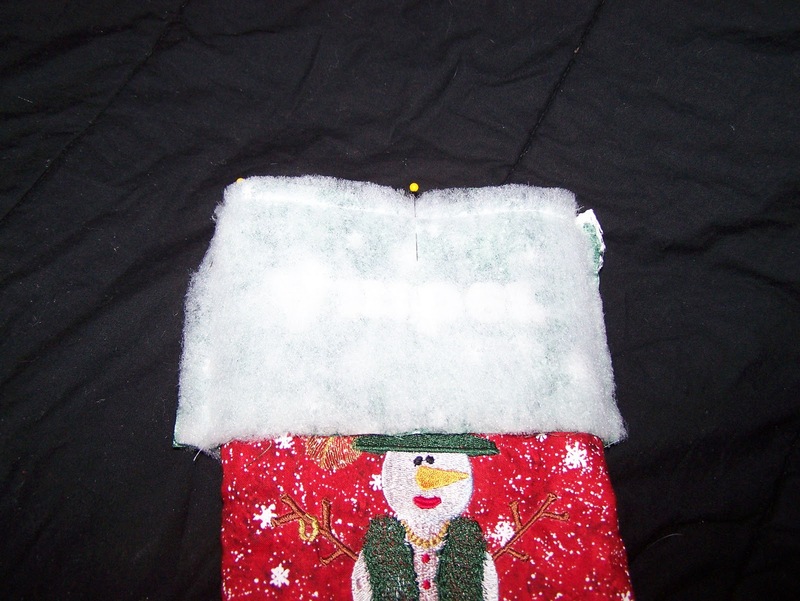 I folded down the edge of the stocking and the lining about 1/2" each, pinning them in several spots to keep them in place. 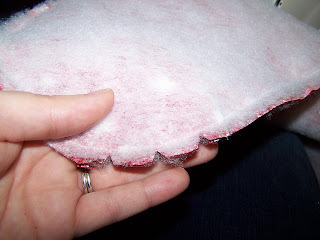 If you want you can use an iron to press each edge down, which will help keep it in place. 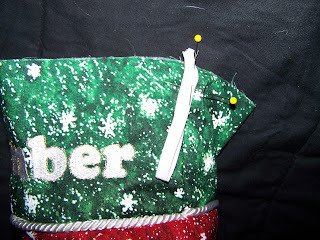 You could also choose to baste each one down, but you will have to remove the basting stitches at the end as they will show. After both edges were pinned down, I lined up the folded edges and pinned both pieces together, hiding the raw edges down inside where they belong, lining up the seams, and making sure that top of the loop was not pinned down inside. Then I stitched around the top, about 1/4" inside the folded edge. 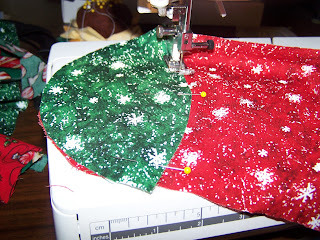 I chose at that point to run another line of stitches right on the edge because I wanted the two folds to be stitched together as close as possible at the edge. This also meant I was sewing through the loop a total of 3 times, so that it was really reinforced and ready to hold all of those Christmas gifts! 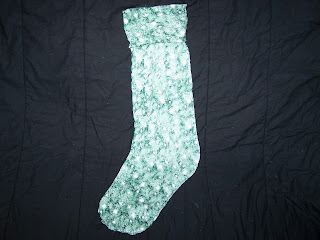 At last, the finished stocking! 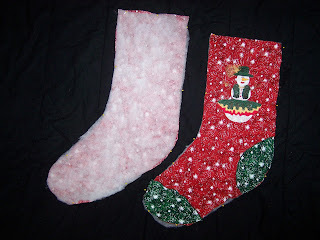 Here's a picture of both mine and my husband's completed stockings. I love how they are individualized and reflect our personalities!